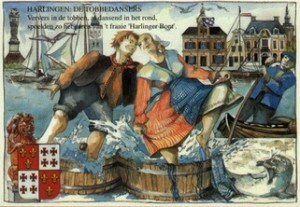 The Frisian town of Harlingen. When you are in for a relaxing, guided walk. 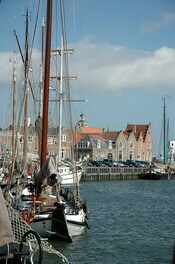 A walk through the historic port of Harlingen(16.000 inhabitants), Friesland, The Netherlands. As long ago as AD 1234 this historic town was granted the town charter. The guided tours last approximately 1,5 to 2 hours. The duration can of course vary, if so required. On request the walks can be given a specific theme. There are several options as to combining activities like a boatrip, a visit to special venues, a lunch or a dinner. If you would like to be shown our beautiful town from your coach, you can ask for a guide to board the coach and thus be informed about the ins and outs of this town. Walking through Harlingen is like walking in an open air museum. The town boasts more than 500 monuments. Lots of houses from yesteryear when the town was already blooming in every way. 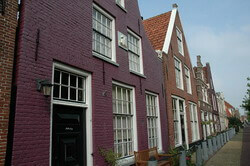 In the middle of “de voorstraat” the small tower that was part of the 16th century town hall can still be found. The current townhall, built in baroque style, is situated on “de Noorderhaven”. Here you will also find the so-called “town hall bridge”, one of the 70 bridges in Harlingen. The very best of the warehouses, a real showpiece, can be seen on the corner of “the roepersteeg/Noorderhaven” with its decorative renaissance step – gable. 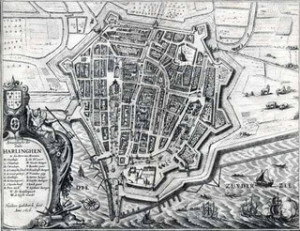 All the buildings along both sides of this (harbour) stretch of tidal water, are among the finest Monuments in The Netherlands and are thus protected by our National Trust. There are 15 tour guides in Harlingen. They are all volunteers that are very proud of their town and they can enthusiastically tell you everything you want to know about what made and makes this town tick. These historic buildings have always been and will always be an outstanding part of this, the only port in the province of Friesland. You are invited to experience a relaxing tour of the town! 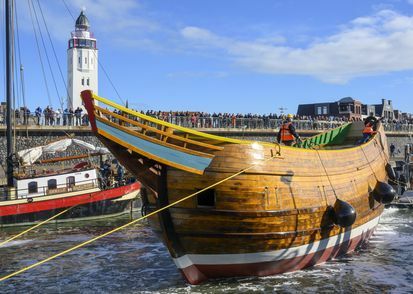 A replica of Willem Barentsz’s ship, the Witte Swaen, is being built in the Frisian seaport of Harlingen. This is done as much as possible by a large number of volunteers according to the construction method of the late 16th century. In 2018 the ship was launched for further dismantling and can be visited. Every year more than 10,000 visitors visit the two “Zaanse” houses in which the visitor center is located. 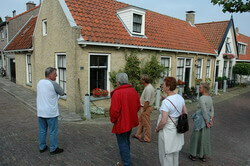 The Harlinger City Guides offer the possibility to start a city walk after a visit to the yard. A city walk can also be ended with a visit to the yard.